ControlsFX 8.20.7 only worked on JavaFX 8u20. This has been fixed so ControlsFX 8.20.8 works on JavaFX 8u20 and later (such as the just-released 8u25). ControlsFX-Samples was not executable because we changed our build scripts in 8.20.7 and forgot to include the relevant manifest attributes. This has been fixed. SpreadsheetView continues to receive bug fixes (and unit tests). It was not possible to use the Notifications API in an OSGi environment – now it is. And of course a bunch of other useful bug fixes! The task progress view is used to visualize the progress of long running tasks. These tasks are created via the Task class. This view manages a list of such tasks and displays each one of them with their name, progress, and update messages. An optional graphic factory can be set to place a graphic in each row. This allows the user to more easily distinguish between different types of tasks. A control used to perform a multi-selection via the help of two list views. Items can be moved from one list (source) to the other (target). This can be done by either double clicking on the list items or by using one of the “move” buttons between the two lists. Each list can be decorated with a header and a footer node. The default header nodes are simply two labels (“Available”, “Selected”). If you are unfamiliar with ControlsFX, you can get an overview of the main features. As always, you can download the latest release from controlsfx.org, as well as find the latest release and hourly snapshot builds on Maven Central. I may be missing something but I find it hard to get the list of fixed issues for each ControlsFx release. Is there a release notes documents or a filter somewhere on the Bitbucket bug tracker? Just look for the 8.20.8 tag, and then keep going until you see the 8.20.7 tag. 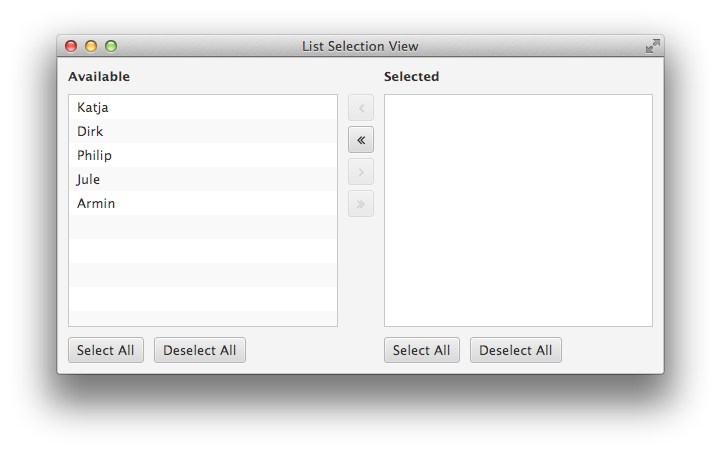 I’m using this new ListSelectionView to add a specific type of object on the source and target list. Is it possible add a CellFactory? I just updated controlsfx jar from 8.0.6 to 8.20.8. Now, When I run my code, a little column is added to my existing columns, distorting my GUI. Please is this a bug? What can be done? Thanks. Is there a way to manipulate the lower and upper thumb of a RangeSlider object in CSS? I know with just a Slider, it’s thumb could be accessed in CSS by “.slider .thumb” followed by style information. Just curious if that were possible. Just wondering if anyone has any good links on how to get FontAwesome stuff working offline with ControlsFX? Thanks for the help.